Rick Rogers is the Music Director of the Reel Cowboys. He is also one half of the musical comedy team of "Evans and Rogers." Gifted with an elastic quality to his handsome face and powerful voice, this song and dance man began his entertainment career at age ten, performing in the style of Al Jolson, Eddie Cantor and James Cagney--giving his expert impressions of the same. His unique talent and boyhood genius--not only as a performer, but also as a self-taught entomologist--landed him on The Steve Allen Show, The Virginia Graham Show, and To Tell The Truth (as the real Rick Rogers). Rick performed in USO shows, and when older, in Las Vegas lounges. At age twelve he had the unique pleasure of performing at the Troubadour with Tiny Tim. As an adult performer, Rick has been a special guest on the BBC-TV program The Big Award, as well as The Crook and Chase Show, The Stephanie Miller Show, plus three guest appearances on The Howie Mandel Show performing his original novelty tunes. In 2006, Rick performed his incredible Eddie Cantor impersonation in New York City at the request of the Cantor family. Backed by Vince Giordano and his Nighthawks, Rick performed in Time Square at Joe Franklin’s comedy restaurant. His tour also included a recreation of an Eddie Cantor 1938 radio broadcast for which he received an award from The Friends of Old-Time Radio convention in Newark, New Jersey. In 2006, Rick teamed up with Sharon Evans and together they write and produce their own variety shows, perform at festivals, local venues, and special events. 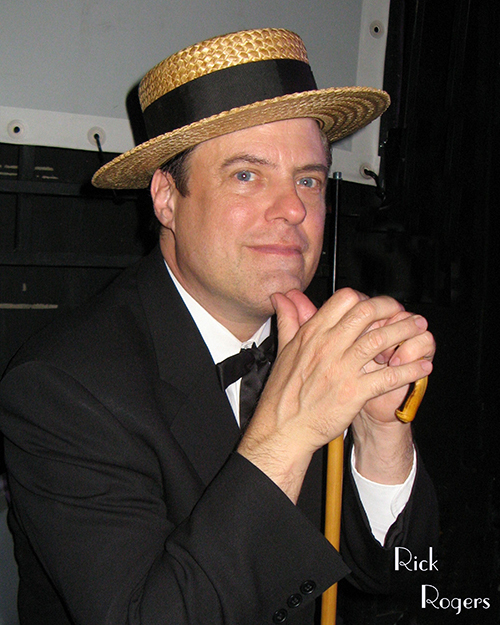 As Evans and Rogers they were called "Vaudeville sensations" in November 2009 issue of Vanity Fair Magazine after their appearance at Maxwell DeMille's Cicada Club. In 2011 Rick & Sharon became husband and wife. Both are recipients of the President's Award from the Southern California Motion Picture Council.